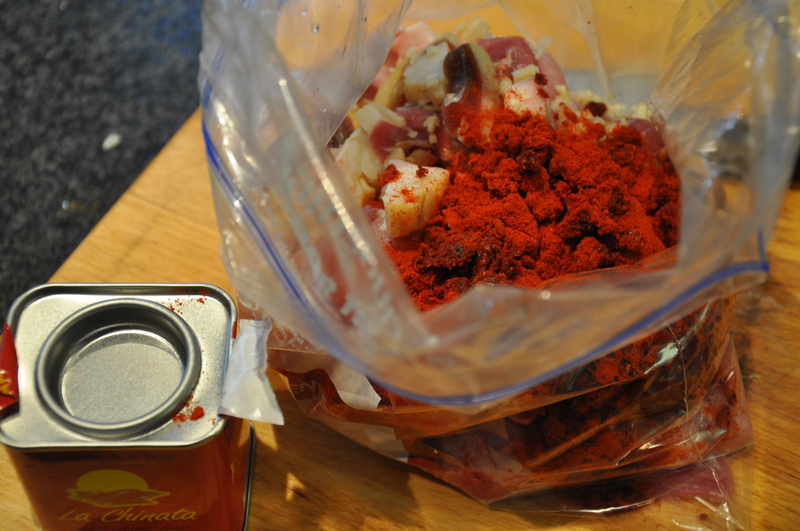 I use sweet spanish paprika but if you want a spicy kick to your chorizo substitute for hot smoked paprika or add a little chilli powder to the mix. The most important thing when making any sausages in to make sure all of your equipment is scrupulously clean. When making sausages, you increase the surface area of the meat and any bacteria present on the outside of the meat will be mixed into the middle as you chop or mince. Because of this, it is of utmost important that you do not add any more unnecessary bacteria, so ‘working clean’ is a must. Running equipment through a high temp wash cycle in the dishwasher just before use should do the trick. Chorizo is traditionally hand chopped so its more chunky than a traditional british banger, so you don’t even need a mincer to make these. A sausage stuffer will make your life a lot easier if you want to make proper sausages but you can manually stuff the casings with the mix using a funnel and a spoon to push it through or simply form the mix into meatballs or patties and fry immediately, the mix will keep in the fridge happily for a week. Chop the meat by hand as finely as you can, or you can use the coarsest mincer attachment. Add all the other ingredients (bar the sausage skins) to the bowl, mix until well combined and leave to stand for at least an hour in the fridge to allow the flavours to mingle and develop. If you aren’t stuffing into casings you are already done – how simple is that! If you are stuffing, you need to feed the hog casings on to the end of the nozzle on the stuffer or onto a funnel if doing manually. Push the mixture through until it starts to form sausages and continue until all of the mixture is used up. 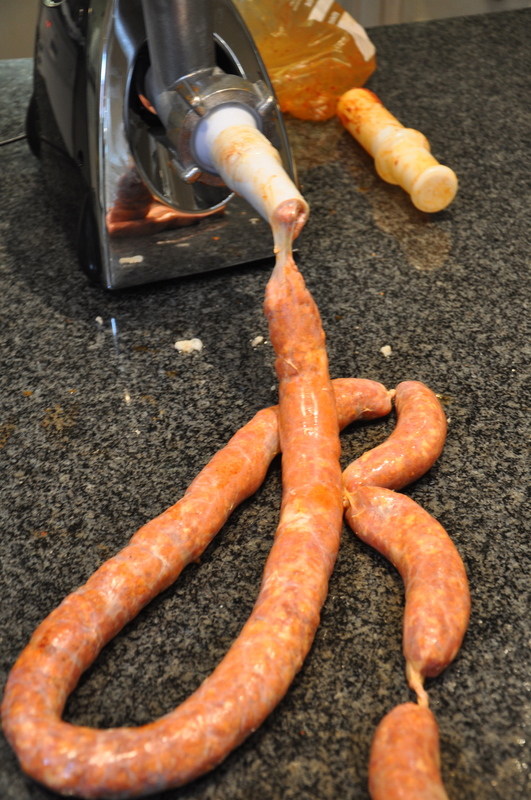 Twist the sausages to your preferred length (oooer) and hang in a cool dry place to dry a little, at least for 24 hours. If you like you can twist the sausages into links, there are many videos on you tube that will show you how, its pretty simple, this was my first attempt and worked out pretty well I’d say. Once dried for a little they are ready to cook, perfect cooked simply and eaten with bread and some rocket or for adding their wonderful flavour to countless other recipes, they go particularly well with pulses and of course in paella. 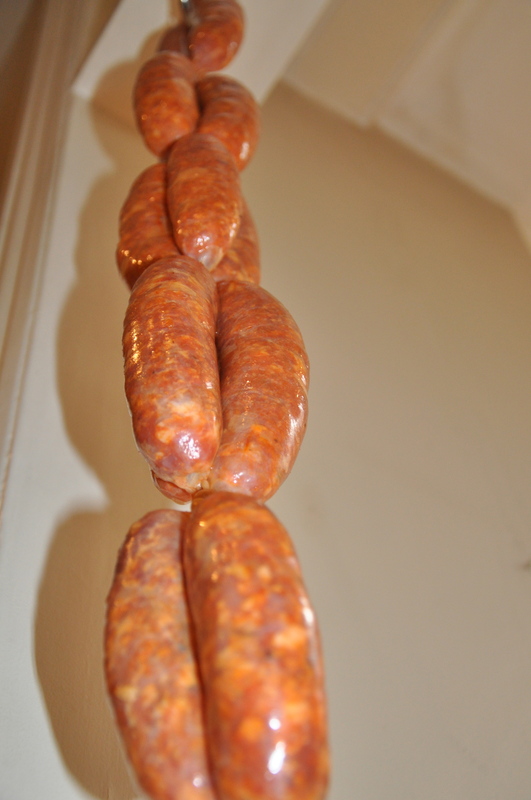 You can hang your chorizo to dry for a month or more before eating it but would suggest that a couple of weeks is best and I would generally cook it rather than eat it raw just to be on the safe side.